So you wanna catch a 10lb trout? I ask you - are you prepared to accept a blank day? Double digit fish are not an every day occurance. In fact, many locals go a lifetime without catching one. There are many tales of the one that got away, and fact or fiction, these are always good for getting us coming back for more. Sarah Yeager with a glorious high country trophy. This was one of only two trout seen this day. To hit a trophy fish you need persistence. You must put in the time, and the groundwork to locate these fish, and keep coming back, time and time again. 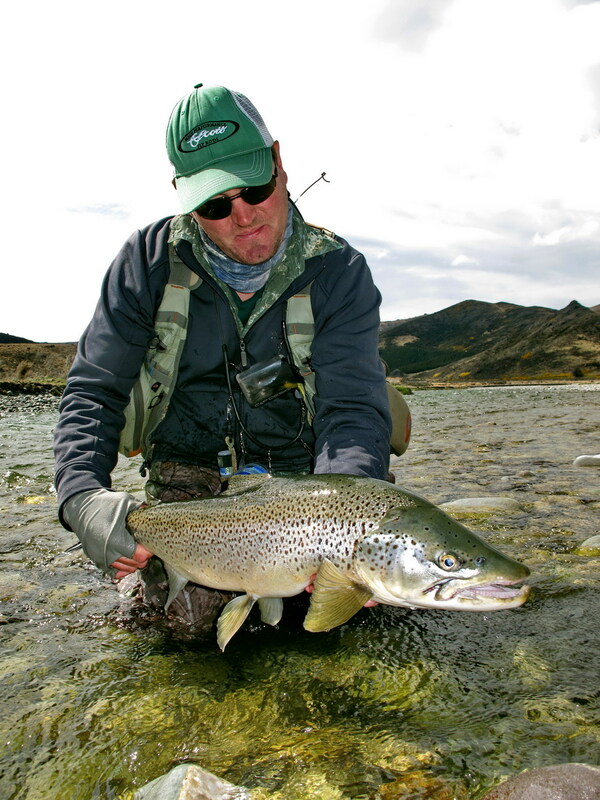 The rivers these fish inhabit rarely hold large populations of trout. You may walk a long way between fish, and even then, if they are not out and feeding, or are hunkered down close to cover, it is very easy to walk straight past them. Do not expect a lot of shots on a trophy quest - you may only see but a handful of fish on any given day, so you must be on top of your game. This is where an intimate knowledge of their waters comes into play. Large fish will inhabit only the choicest of pools, and until driven out by angling pressure, or environmental effects, will reside here often year in, year out. If you know of a pool where a trophy lurks you are already at a distinct advantage over the fish! Trophy Hunter, Brian Read puts in the time and committment and the results are clear. The rivers in which these fish reside are often sourced high up in the alps, and the nature of the valleys these waters cut through mean stiff, alpine winds sweep down constantly. If you are not adept with blustery headwinds, then you will struggle - these waters are not for the novice. Russ Willeke with a hard earned 12lb trophy - This fish took after 40 minutes of precise presentation and fought hard for a further 20 mins. Practise makes perfect, and if your casting is not top notch it can make for a long day. Big trout in clear waters are never easy - they are old enough to know what should, and should not be happening around them, and it is imperitive to make that first cast count - one botched presentation, or dragged drift and he is gone, leaving an often long walk to the next opportunity. Practise accuracy and presentations on the lawn at home - 10 minutes a day, three times a week prior to your trophy chasing trip - the practise will pay itself back threefold when you slip in behind a feeding double digit. They say that your first cast is your best shot as nailing a trophy - and with every subsequent presentation your chances of hooking him lessen. Im not sure if I subscribe to this, for as long as your presentations are practised, and you remain out of sight the trout will not become aware of your presence. however, there is merit in making your first cast count. We dont call these 'one shot' fish for nothing. Chris with a trophy on a day when most anglers would stay at home. 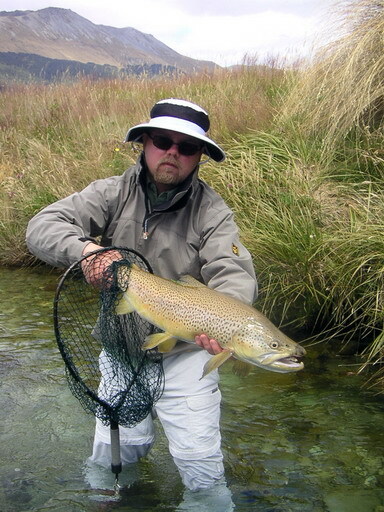 Inclement weather is perfect for streamer fishing, and for finding big fish out in the open. Whilst trophies will often accept small flies, they are efficient feeders. 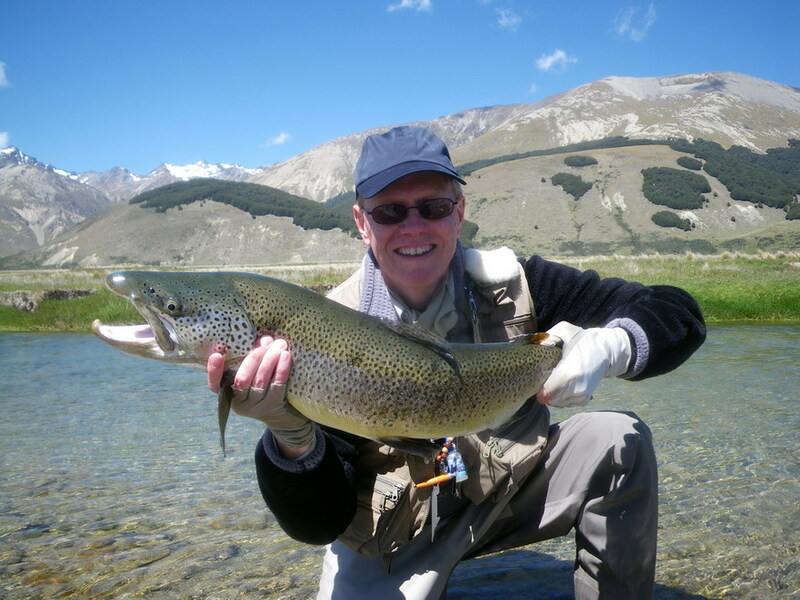 Most trout above three or four pound will need to become cannibal to survive - the cool, clear headwaters do not harbor the abundance of invertibrete as the more fertile lowland rivers do, and so these high country fish must make the most of any available food supply. Mice, terrestrials and small fish are welcomed, and as a number of these fish spent their early years in tidal esturies, or lake systems, they recognise the nutritional benefits of other fish. Large streamers are a favourite of mine and take the guess work out of trophy hunting. There is no doubt, unlike when fishing a small size 18, that the fish has seen your big size 2 streamer - he now has but two choices - yes, or no. If you have done your homework and know of a trophy pool, and yet the fish is no where to be seen, a careful cast or two with a large streamer will often pull him from cover. I enjoy swinging a big double bunny across drop offs or retrieving them along cut banks - if it tugs, tug back. 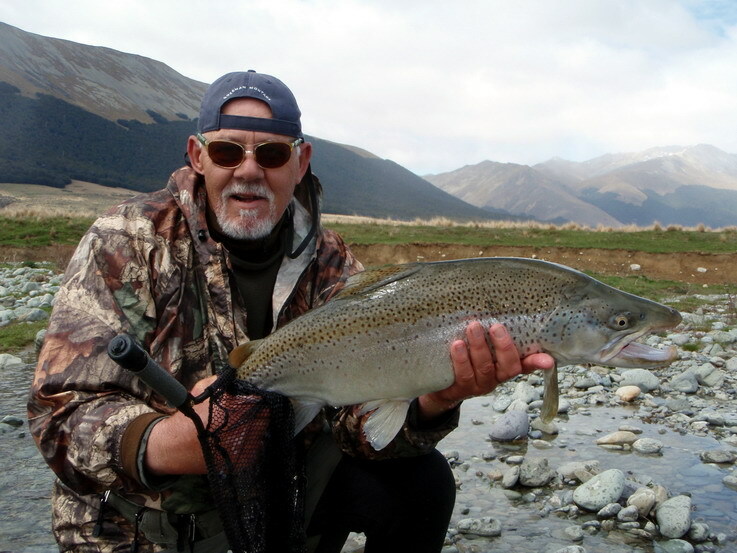 Roman Kafdra of Queenstown with his first 10lb fish. Roman has now caught this fish on two, possibly three occasions over the years now, testiment of their territorial behaviour. Dont set aside just the one day if you wish for a trophy. On rivers where they reside, we may walk all day and not see a fish, despite knowing their hangouts. We may not get the right weather, or wind for the stream we intend to fish. Or once in behind the fish of a lifetime a cast may go astray, or a false cast becomes noticed, or a stumble on the riverbank may send tell-al vibrations to the fish and he is no more. To fully appreciate the trophy hunting opportunities you must be on top of your game and not be dissappointed my missed opportunities, or lack of fish. Three days or more should be allocated to really get the feel of the terrain, and the requirements to maximise opportunities. These fish are fit, alert and tactically proficient, and so too should we. 12lb success for Brian. We targeted this specific fish several times over the course of two years before we finally caught him. Big residents hold out in the best of pools year in, year out. And even when you feel ten feet tall and bullet proof these fish are quick to shoot you down to size. Perfect presentations may go seemingly unnoticed and you mat cover these fish time and time again to no avail. Once you finally get everything right, your fly is correct, the drift seems perfect your imitation becomes but one of maybe several or more food items the trout has to choose from. He wont always take yours just because it is there. 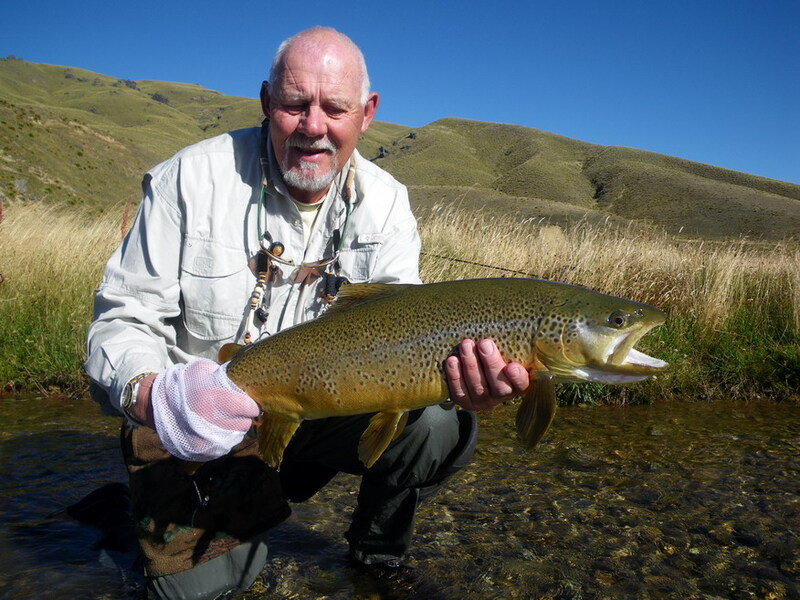 The ability to present a fly time and time again on the button comes into play when chasing trophies, in often heavy winds and challenging conditions. Practise makes perfect, and I cannot stress this enough. Tiger Woods doesnt just turn up to an open without practising regularly beforehand. Neither should you turn up to the big game unprepared. A 10lb fish is an unforgiving opponent, and a rather harsh referee. Ari Toivenen with a 10 1/2lb backcountry brown. Hard earned after days of little success, despite covering numerous fish. No matter how you hold the fish, remember - a 9 1/2lb trout is not a 10lb trout. Be honest and call it on the scales... Nice try, Chris.